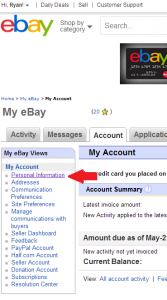 How Do I Change My Ebay Password? By now you’ve probably heard the news that due to a security breach eBay wants you to change your password. If you’re like me, you haven’t changed your eBay password in at least 10 years. My twitter feed was filling up with people asking how to change their eBay password, so I figured I’d create a quick guide to changing your ebay password. Step 2: Click the “personal information” link. Step 3: Click the “edit” link next to the password row. Pro Tip: You can also edit your 10 year old eBay username on this same page. The hacked information contained username/password/email/address/phone/DOB so it should go without saying that if you used the same username/password or email/password combination on ANY other site, you should change those immediately. The hacked information is already for sale (you can find it here. ) One interesting note is that your personal account information is literally only worth $0.000005138 USD.